At Texas Footwork our philosophy is to prepare young athletes through competition, teamwork and discipline. Our goal is to provide high intensity training in a first class facility where athletes can train year round. Our trainers are always positive which allows every athlete to give it their all during each training session. We motivate athletes to increase speed, develop a positive self image, and build a positive work ethic for life! Our Mission at Texas Footwork is to challenge, push, and motivate young athletes to be disciplined while achieving goals through sports and high intensity training. At Texas Footwork our main goal is to improve your speed, strength and agility. We emphasize on footwork as the core of our training but we also focus on getting you faster. Athletes that lack footwork struggle as they grow older and the competition increases. Athletes with great footwork tend to dominate in their sport and earn college scholarships. We train athletes as young as five years old to build a solid athletic foundation. 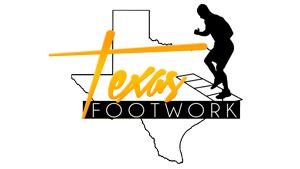 Texas Footwork is centrally located in Humble, Texas. We have flexible training days and hours. Our facilities meets the needs of all children in any category in order to improve their fitness goals. Our indoor facility also allows for training during all weather conditions. To provide a safe workout environment, our facility has indoor turf to help minimize injuries. Turf is a revolutionary product; designed and engineered to create a surface that duplicates the performance and appearance of real grass. Our artificial turf is unlike any other. It looks like grass, feels like grass and plays like grass.